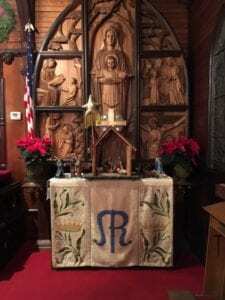 The Pacific Grove Chamber of Commerce invited St. Mary’s to be featured in their annual Christmas at the Inns tour on Wednesday, November 28, 2018. This is the event where local innkeepers decorate their stately manors with twinkling lights and holiday décor, inviting the public in to see their Victorian-style rooms and antiques. We’re delighted to be able to open our doors to the community at this festive time of year. The altar will be decorated with green embroidered linens and brass candlesticks. Church hosts will be on-hand to provide information about church history, the architecture and to point out our Tiffany windows and the stories related to the other prominent stained-glass windows. Musicians will be on-site playing hymns and holiday music for our guests to enjoy during their visit to St. Mary’s. Please call the Chamber office at 831-373-3304 for information about securing tickets to this community event.